There’s an elderly gentleman in a nursing home, suffering from some elements of dementia. His present day is intermingling with memories of his youth; during the depression, he worked on a circus. There is laughter, tragedy, love, death. Everything you need for a good yarn. I find that the elderly person reminiscing on their youth can be a really overworked structure unless it is done really well. 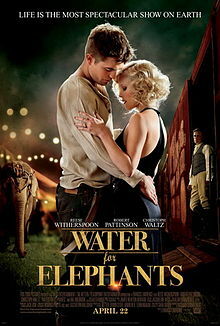 For me, it was the perfect structure for the book of Water for Elephants. The character of the old man who has lost his independence and is feeling helpless and that he has had his dignity stripped from him was beautifully portrayed and led into the actions that he takes. It’s a very enjoyable book with a lot to keep you interested, and a lot of historical fact that I found fascinating. I was extremely hesitant to watch the film as I am not the biggest fan of Robert Pattinson, the star of Twilight. It’s a small thing, but I often find that his lips are far too red, and I find that odd. Then I discovered the film also starred Reese Witherspoon and Christoph Waltz, and I am quite a fan of both of their work. For a film, I don’t think it needed the old man reminiscing at all. Especially because all of his character was taken away and he was just left an empty vessel telling the story. There is enough in the story that it would have stood alone as a film. Plus, there are several times in the book when a period of time passes; a few days, or a week, but the film rushes through this and, I feel, loses some of the development of the story. Both the film and the book are good; entertaining, different and interesting, but not brilliant.